Four-year-old Evan knows how to keep himself busy. On any given day you can likely find him doing one of his favorite things—building Legos with Dad, pouring over his Star Wars books, or playing outside with his brother and sister. Knowing it was a holiday and wanting to get a second-opinion fast, Evan’s mom called someone she knew and trusted—Grandpa Harold. Evan is one of Dr. Ashcraft’s 10 grandchildren. Grandpa Harold brought Evan down to his office later that day for an eye exam. His right eye turned inward toward his nose, a sign of strabismus. 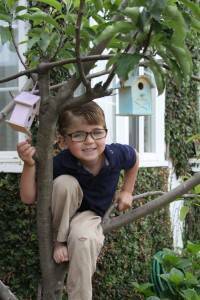 Evan was referred to a pediatric ophthalmologist. Jeni was relieved after meeting with the ophthalmologist, who “assured us that this was something that could be treated”. Each of our eyes has six tiny muscles attached to it. The brain constantly sends signals to these muscles and directs our eyes to move up, down, in, or out. Normally our eyes work together to focus in the same direction. But for people with poor eye muscle control, an eye can “turn” or wander in a different direction than the other eye. This condition where the eyes do not line up is called strabismus. What Happens When Your Eyes Misalign? When your eyes move in different directions, your brain gets confused because of the two conflicting images it receives. If this occurs often, eventually your brain will ignore the image received from the “turned” eye. The straight focusing eye will become dominant, while the “turned” eye will become the weaker eye. “Pediatric Eye Surgery and Strabismus” by Ophthalmology Ltd.
How is Strabismus Diagnosed and Treated? Strabismus is most often diagnosed in young children, usually between the ages of 1 and 4 years old. It is not unusual for a newborn’s eye to sometimes wander, but this will usually stop by the time he or she is 4 to 6 months old. Children will not outgrow strabismus, so diagnosis and treatment should begin as soon as possible. At Evan’s first visit with the pediatric ophthalmologist, he was prescribed eye glasses to wear regularly. Later, he was also given an eye patch to wear for a few hours each day. By patching the dominant eye, the “weaker” eye is forced to work harder to see. The muscles and vision of the weak eye will get stronger with time. If it is difficult to implement patching, special eye drops can be placed in the child’s stronger eye to temporarily blur its vision. Similar to the purpose of patching, this will strengthen the weaker eye by forcing it to work harder. If necessary, eye muscle surgery can help strengthen or weaken certain eye muscles causing eye turns. In the past few months, Evan’s family has noticed that his eyes cross less frequently than before. 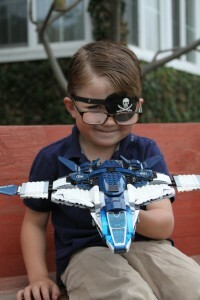 While it took some time to get adjusted, wearing his glasses and eye patch has become part of Evan’s daily routine. Besides, it is actually kind of fun when you can wear your pirate eye patch out and about! If you have noticed your child’s eyes wander, schedule an appointment with Dr. Ashcraft for an eye exam. The earlier diagnosis and treatment occurs, the better chance there is of a full and positive recovery.